The condition of a waterway tells a larger story about the deep waters of the communities it serves, as our continuing series, ‘The Creeks of Melbourne’ documents. For the full multi-media package, click here. In the middle of Darebin Creek at Thomastown East Recreation Reserve, a sign reads “danger, do not swim”. Rafts of algae float above the greenish-like water, accompanied by empty packets of chocolate, water bottles and cans. There are no residents in sight. There’s the faint hum of cars along the freeway, and planes flying low as they prepare to land at Tullamarine. Starting on the outskirts of Wollert, the Darebin Creek runs about 50 kilometres down south into 10 Melbourne suburbs. It passes through Thomastown and Preston, until it merges with the Yarra River in Alphington near Ivanhoe. Rasheeda Cooper has lived in Thomastown for more than decade, and regularly walks along Darebin Creek. Initially drawn to the creek’s natural beauty, she is passionate about preserving the local environment. Yet not everyone shares Cooper’s enthusiasm. It took her eight years to get a bin installed by the Whittlesea council at the creek’s adjacent park. Following her efforts, Cooper said “the bin is [often left] stuffed to the brim … people leave behind their chip packets, their leftovers”. “Something needs to be done. There needs to be more bins, more community engagement … I don’t think the message has gotten through,” she says. Overseeing the maintenance of the creek is the Darebin Creek Management Committee (DCMC), which works with local councils, La Trobe University and private landowners. 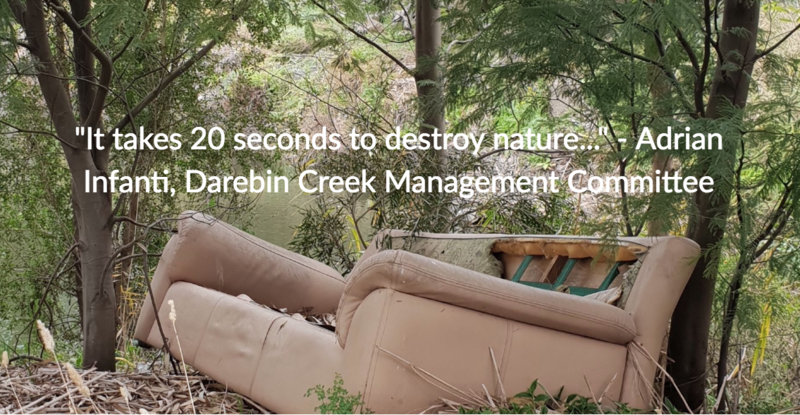 The DCMC is funded by the Darebin, Banyule, and Whittlesea councils, with funding proportional to the amount of creek that runs through each council. “If we get that, and more funding, we can see the creek getting better in the next 50-100 years. We have to put in the work now, so that future generations can benefit,” he says. Litter is still a problem in Preston and Heidelberg West, but unlike Thomastown, community engagement with Darebin Creek is on the rise. Much of the creek’s pollution in Preston can be attributed to Northland Shopping Centre, which sits next door. With 330 stores and services, Northland relies on single-use plastic bags. Northland manager Andrew Drivas said there are “stringent programs in place to remove rubbish and debris”. Yet walking down the creek, past a wall painted with graffiti, reveals a waterway covered in plastic bags, soft drink bottles, and shopping trolleys. “Something needs to be done … I don’t think the message has gotten through”:Rasheeda Cooper (right) standing next to one of the few volunteers for Clean Up Australia. reston resident and former Greens candidate for Batman Alex Bhathal said “the creeks have always had a dumping problem. “Houses near the catchment area need to be careful what they put down,” said Bhathal, pointing to detergent and plastic as the source of the creek’s rubbish problem. With the recent work of local volunteer groups such as Friends of Darebin, who clean up and plant trees along the creek, Bhathal has noticed a reduction in rubbish in Preston. “Things are on the up,” she says. While Thomastown and Preston face challenges in maintaining their respective parts of the creek, the Darebin Parklands, which run through Alphington and Ivanhoe, are a striking contrast – clean and well maintained. Local schools have taken up the cause of preserving the creek and engage with it regularly. Mary Immaculate Primary School learning and teaching leader Sharyn Mizzi said the Ivanhoe school’s 2018 art exhibition was themed the Wonder of the Darebin Parklands. The fact that the school has access to a part of the waterway that is inviting, accessible and safe obviously is a substantial advantage in introducing students to the environment. It’s a different story further upstream where the creek is polluted and difficult to access. Deputy principal of St John XXIII Primary School in Thomastown East Caroline Galea said students “do not study the Darebin Creek or its history” as part of the curriculum. It’s something of a chicken-or-the-egg conundrum. How do you build a culture of environmental care without exposure to the rewards it brings? Cooper’s observes that daughter’s school does not have a recycling bin. “When children aren’t learning from school … they’re not going to know what to do with their trash, and they’ll end up throwing it anywhere,” she says. Kim Le Cerf, the Mayor of the City of Darebin Rucker Ward, is hopeful that attitudinal change is happening, and that communities that have to date been largely indifferent to the condition of their waterway may begin to engage with it. The first battle is helping them to see it in a new way. “Being such industrial areas, the creek in these parts [Thomastown and Preston] has traditionally been hidden from the community, like an untouched treasure that they don’t know about,” said Le Cerf. What is currently being done to maximise the potential of these more secluded parts of Darebin Creek? Le Cerf said the creek’s management committee has been discussing its options. “We are looking into planning schemes and to opportunities to harmonise, so that there’s a consistency along the creek as you move through the councils,” she said. For now, conditions along Darebin Creek provide a reflection of the social and economic conditions of the communities it flows through. In the leafy, more moneyed quarters closer to the CBD, the waterway is in good to excellent condition. But upstream in the struggletown of Thomastown, it remains largely neglected. A brown canvas couch sits wedged between three trees on the bank of the creek, while half of the wheel of a bike sits above the murky brown water. The connections between social and environmental conditions are complex and nuanced. Some of the story is around the public resources and priority that are given to caring for the environment, versus the demands on local budgets for human services. Patterns of people’s work and life demands will influence the way they engage with the environment, and their expectations of it. With higher income comes more independence, and more time to commit to cleaning up and maintaining local spaces. Nature can be expensive to maintain, and Darebin Creek is proof of that. For the full multi-media package, click here.